Steve Lewis is a Murdoch journalist who has never seen a Liberal Party dirt file he didn't like. Managing editor David Donovan paints a picture of a sad and desperate individual. SOMEHOW, widely discredited News Ltd journalist Steve Lewis, even after the scorching James Ashby judgement, has escaped much of the opprobium delivered to some of the other players. Lewis, as you would hope and expect, has never won a significant journalistic award, and has staked his patch on “scoops” based on low-rent “scandals”. For instance, Lewis was the man who publicised Kevin Rudd’s alleged “in-flight tantrum” of May 2009, when he was PM — apparently over a hairdryer. Lewis fixes his eagle eye on matters vital to the nation — in no way whatsoever. Prior to this time, Rudd had enjoyed record high approval ratings as Prime Minister. The abysmally petty and unnecessary story Lewis somehow grubbed up served to mark the beginning of Rudd's decline, which resulted in his eventual loss of the Prime Ministership of Australia. 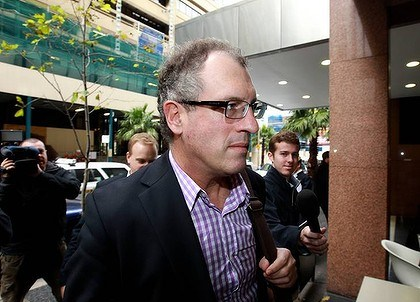 Lewis is also the man who ‒ were News Ltd publications run like other similar journalistic enterprises ‒ would never have been allowed to report again after the diabolical June 2009 Godwin Grech / Utegate affair – otherwise known as the Godwin Grech fake email affair ‒ that spelled the end of the previous Opposition Leader, Malcolm Turnbull. Lewis, without any doubt, did not exercise the requisite due diligence in verifying material – that was later proven to be false – and, indeed, falsified – before publishing. There are important questions, which he somehow seems to have avoided, as to whether he played a double role in this affair; as to whether his actions served, in fact, to end the leadership of the widely respected then Opposition Leader, Mal Turnbull. Certainly, this affair paved the way for Tony Abbott to take over the Liberal Party leadership. And eyebrows were raised by the embarrassingly effusive manner in which Lewis introduced Abbott at last week’s National Press Club Luncheon. The same luncheon in which the arrest of Craig Thomson was announced during Abbott’s very own address; the very same luncheon that Steve Lewis had MC'd — after he'd announced the imminent arrest of Thomson just the night before. Lewis was also the reporter who worked with LNP operative James Ashby to destroy the career of long-time Sunshine Coast MP Peter Slipper, less than three months after Slipper had taken over the Speaker’s role in the Australian Parliament. Mr Ashby: “Great Thanks for coming up”. I am not satisfied that Mr Lewis was texting Mr Ashby, while he was boarding a plane, about “getting” a driver. It is difficult to see why Mr Lewis would use the words “get him” rather than “find him” if he was talking of locating a driver. Moreover, Mr Lewis’s next comment: “I am here to help!! !”, in response to Mr Ashby’s thanks for his visit, again suggests collaboration with Mr Ashby and Ms Doane in damaging Mr Slipper. I find that on 4 April 2012, Mr Lewis referred to Mr Slipper when he wrote: “We will get him!!”. Knowing what I now know, after investigating the Slipper Conspiracy for over nine months now, Steve Lewis has become a damaged iitem — his reputation, it seems to me at least, is almost irreparable. Who knows, maybe he is a great bloke, but just a lost and desperate man. Lewis is no hard-drinking, hell-raising, out-all-night hack. He’s a family guy, an industrious, diligent reporter, a founding member of the Press Gallery’s singing group, the House Howlers. It was Lewis who mostly conceived the Press Gallery’s now fabled Midwinter Ball, which has raised thousands for charities. He’s an enthusiast for the old rule bashed into newspaper cadets (remember them? ): get it first and get it right. Print journalists achieve longevity in Canberra either because their commentary and analysis is good enough to attract a decent following, they’re standout writers, or because they get scoops. Lewis is a scoops man, in the business of getting exclusives where others can’t or won’t look. They may not be all memorable but they’re frequent. It’s the hardest of all career platforms to maintain within the press gallery; scoops take more shoe leather, cold calling and shoulder-rubbing time than does an incisive piece of commentary or a gilded piece of writing. Fine writers and insightful commentators have the protective bulwark of reputation and following. For scoop-getters, they’re as good as their last; when the scoops stop, so does the career. Lewis was a journalist in need of the next scoop. And that’s how Steve Lewis came to be the journalist who broke the whole reeking Peter Slipper saga, abetted by the political insiders who wanted Slipper out of the Speaker’s Office and out of Parliament.